The weather in Rome -- usually mild, sunny, agreeable -- hasn't been its usual self lately, experiencing an actual snowfall a couple of weeks ago and currently, a marathon of rain. Raindrops have made an appearance nearly every day the past few weeks, so much so that a glimpse of sunshine has become a noteworthy occasion. Gray clouds and the constant presence of anything from a steady drizzle to a heavy downpour is the norm lately, and as a result, I've done what anyone would do: I've taken to wearing my trusty rain boots, carrying around my half-broken but still functioning umbrella, and have embarked on a month-long comfort food kick. Yup -- March has so far consisted in not just one but two types of cookies, not to mention crispy cozy fried chicken, and now biscuits, perhaps the quintessential American comfort food, because if there's anything capable of brightening up your day when the sun has taken the day off, its biscuits. First things first! Biscuits, much like funfetti, is a distinctly American food, one that seems to cause confusion outside of its country of origin. The American biscuit is not to be confused with "biscuit" as Brits know it, which is what we Americans call "cookies." 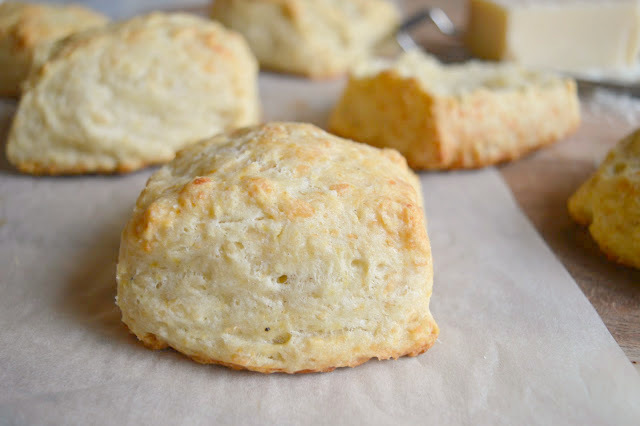 Rather the American biscuit is more akin to a scone, but flakier, and can be both sweet (with the addition of a little sugar and/or vanilla) or savory (no sugar and a little more salt). They're a specialty of the southern states in the U.S, and can be used as the base for your classic shortcake, eaten as is, slathered in butter, drizzled with honey, served with gravy (a Southern specialty) or eaten with soups and stews. 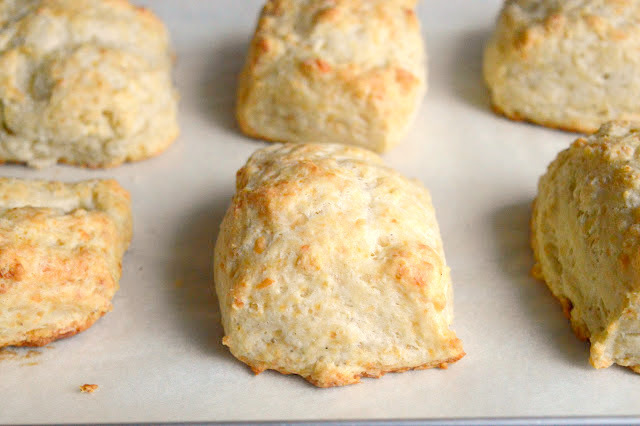 Having given you that little introduction, I'll keep the rest of this post brief, as these Savory Double Cheese biscuits are quite self-explanatory -- an extensive commentary as to why you should make them would be unnecessary. 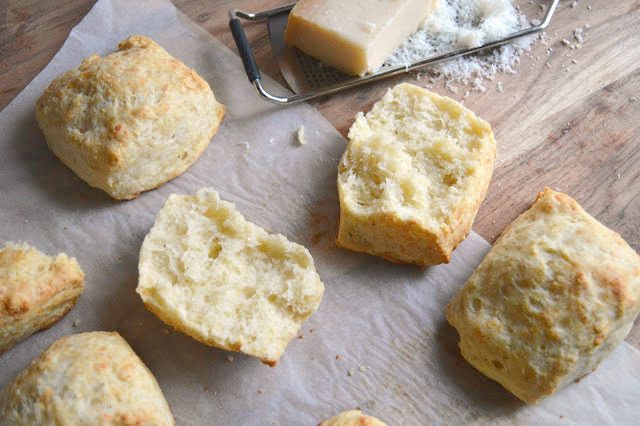 After all, they're the pinnacle of all things delicious, unrivaled and undisputed in their goodness (you would, in short, be hard-pressed to find anyone who doesn't like biscuits) and in the case of this recipe, the place where two of the best ingredients in the world -- butter and cheese -- meet and join forces. These biscuits are biscuits 2.0, or biscuits living their best life, super tall and stately and glorious (baking powder + baking soda + leaving the dough fairly thick will do that) and perfectly golden, extra flaky, a little salty from the Parmesan, a little spicy from the black pepper, and a little tangy from the goat cheese. To say they're downright magnificent is not an exaggeration, and period of never-ending rain or not, you'll want to make these. A couple of notes: You can use whatever cheeses you want here; Pecorino, Gruyere, and grated mozzarella would also be nice here. You could probably experiment with adding dried herbs to them to take them in another flavor direction. These are best eaten the day that they're made. Like last week's recipe, today's also comes from the talented Posie Harwood over at www.600acres.com. 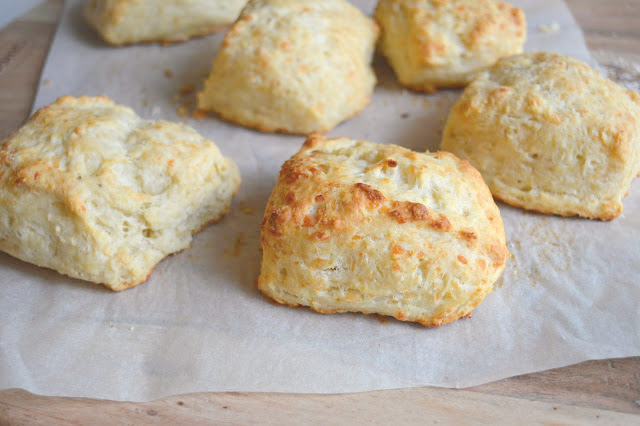 Looking for other biscuit recipes? I've also got these Cacio e pepe Biscuits, plus these Chocolate Strawberry Shortcakes (made with chocolate biscuits, these Tomato Basil Shortcakes, and these Raspberry-Blueberry Shortcakes. Preheat the oven to 450º F (230 degrees Celsius). Line a baking sheet with parchment paper. 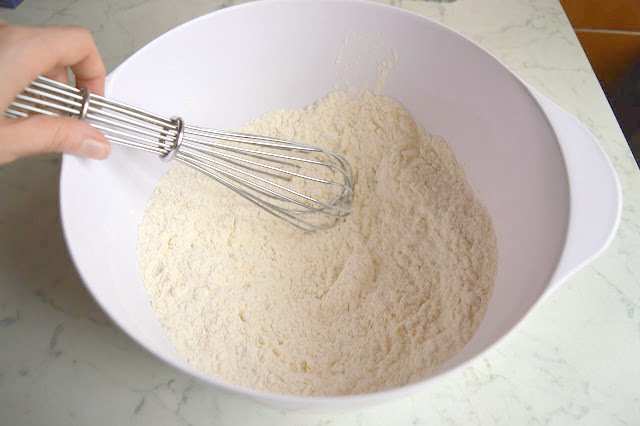 In a large bowl, whisk together the flour, baking powder, baking soda, salt, and pepper. 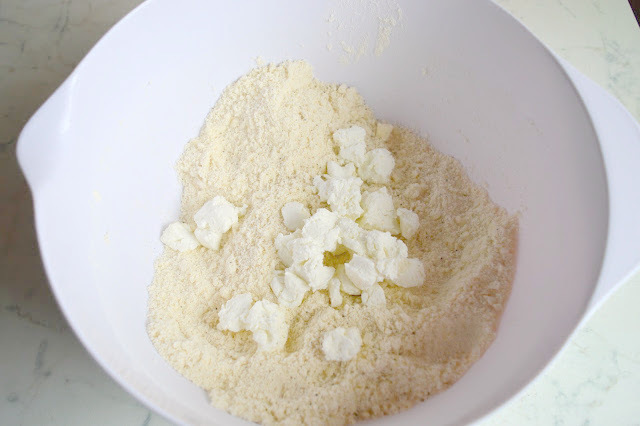 Stir in the grated Parmesan. 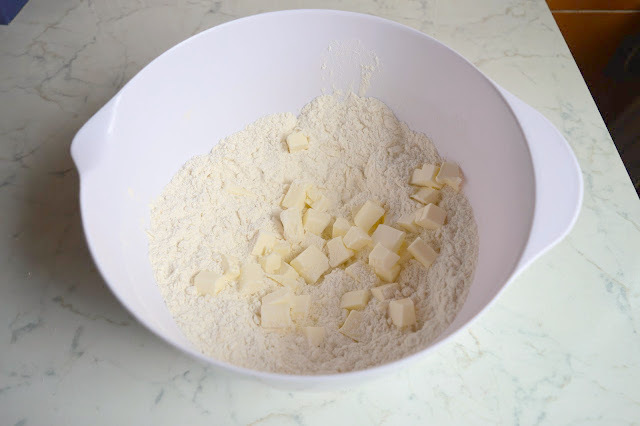 Cut the butter into the dry ingredients using a fork or pastry cutter until it's in mostly pea-sized chunks -- some chunks can be slightly larger and some smaller, but don't overwork it. Add the goat cheese and stir to combine. 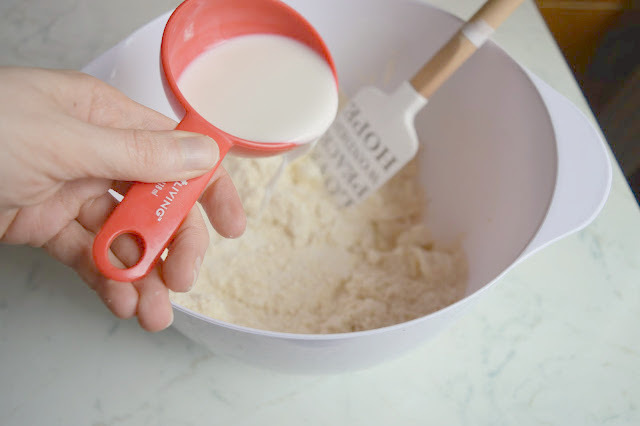 Add the milk, stir the dough with a fork until it is somewhat evenly moistened, then knead it a few times in the bowl so it mostly comes together in a ball but don't overwork it at all. It should not be cohesive and there should be chunks of drier areas and some wetter areas. 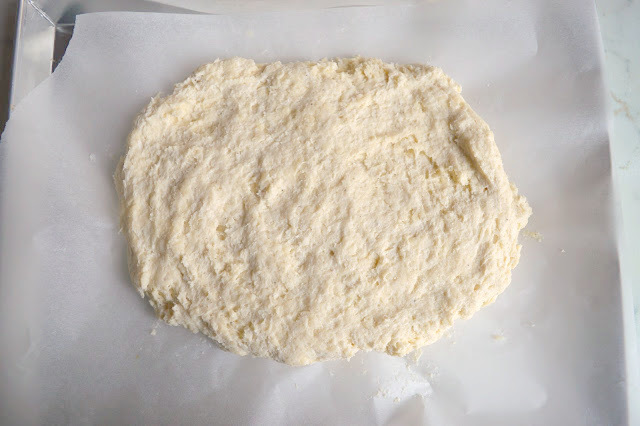 Turn the dough out onto the parchment-lined sheet, and fold it over onto itself until there aren't any dry spots remaining. 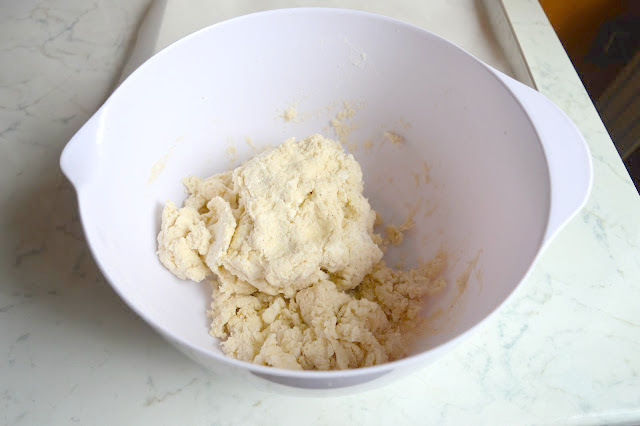 Don't think of this as kneading: You want to handle it gently and as you fold, the wet/dry areas will disappear. 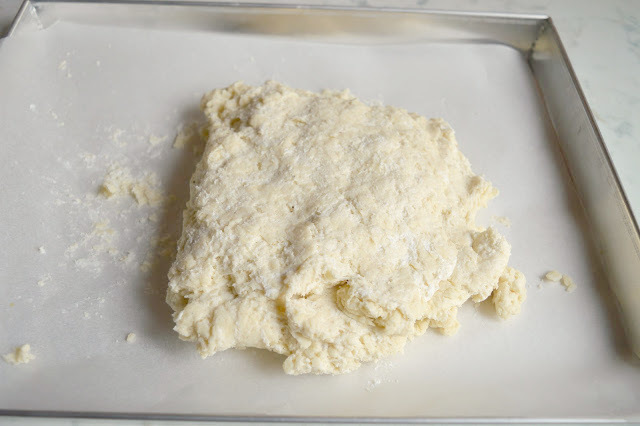 Fold about 10 times, then gently press the dough down to a rectangle about 2 inches high. 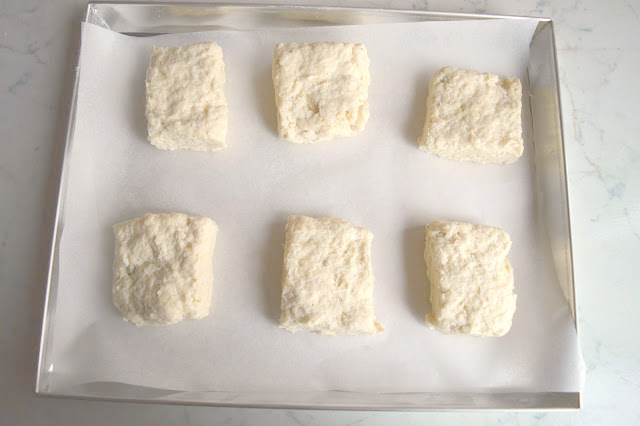 Using a sharp knife, cut the dough into 2" squares and separate them slightly on the baking sheet. Bake for about 12-15 minutes, or until golden brown. Let cool slightly, then eat! Makes 6-7 biscuits (I got about 7).